The requirement for an Airborne Warning And Control System (AWACS) aircraft was outlined by the US Air Force in 1963, at which time it was envisaged that a force of up to 64 of these specially-equipped aircraft would be needed. Economic considerations have made it necessary to reduce considerably the number of aircraft to be acquired initially. The resulting Boeing E-3A Sentry is essentially a flexible, jamming-resistant, mobile and survivable radar station, plus a command, communications and control centre, all contained within the airframe of a Boeing 707. In addition to its long-range high- or low-level surveillance capability, an AWACS aircraft can provide all-weather identification and tracking over all kinds of terrain, and the 22nd and subsequent aircraft also have a maritime surveillance capability. 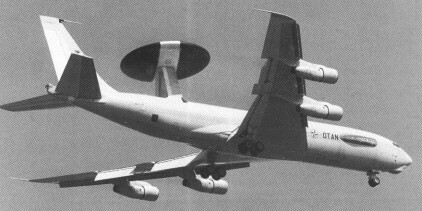 Boeing was the successful one of two contenders for the supply of an AWACS aircraft, being awarded a contract on 23 July 1970 to provide two prototypes under the designation EC-137D. 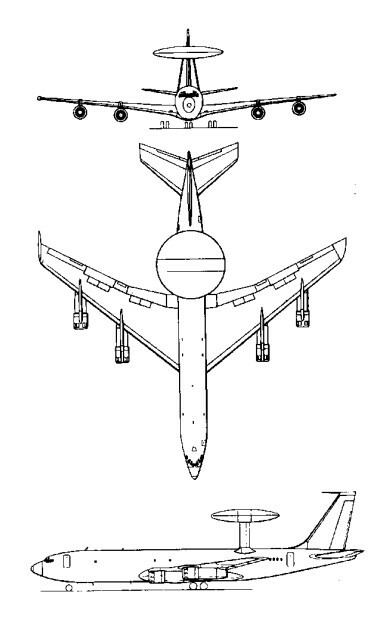 The company's proposed AWACS was based on the airframe of the Boeing Model 707-320B commercial transport, and the prototypes were modified in the first place to carry out comparative trials between the prototype downward-looking surveillance radars designed by the Hughes Aircraft company and Westinghouse Electric Corporation. These tests continued into the autumn of 1972, and on 5 October the USAF announced that Westinghouse had been selected as prime contractor for the advanced radar that was to be the essential core of the AWACS. This has the task of seeking and identifying low-flying targets at ranges as great as 370km, and in the case of high-altitude attack at even greater ranges. Very little modification of the basic 707-320B airframe was needed to make it suitable for the new role. An external, large rotodome assembly carried on two wide-chord streamlined struts are secured to the upper rear fuselage. The remainder of the essential avionics antennae are housed within the wings, fuselage, fin and tailplane. New engine pylon fairings are provided for the more powerful turbofan engines of the pre-production EC-137Ds, and of the production aircraft which were designated E-3A and given the name Sentry. Internal modifications included strengthening of the cabin floor, provision of MPC (multi-purpose console) and other equipment bays, and addition of a crew rest area. Basic operations require a flight crew of four plus 13 AWACS specialist officers, but this number can vary for defence and tactical missions, and other personnel can be cer-ried for systems management and radar maintenance. Liquid cooling protects the radar transmitter, housed in the aft cargo hold, and a conventional air-cycle and ram-air environmental control system provides for crew comfort and the safe operation of other avionics equipment. Electrical power is supplied by generators with a combined output of 600 kVA. The over-fuselage rotodome is 9.14m in diameter and has a maximum depth of 1.83m. This incorporates the AN/APY-1 surveillance radar and IFF/TADIL C antennae. During operational use the rotodome is driven hydraulically at 6 rpm, but in non-operational flight is rotated at one twenty-fourth of this speed to ensure that low temperatures do not cause the bearing lubricant to congeal and prevent normal operation when required. The Westinghouse radar, installed first in the 22nd Sentry, and scheduled to be updated in earlier aircraft, can function as a pulse and/or pulse-Doppler radar, and is operable in six different modes. The data processing capability of the first 23 E-3As is provided by an IBM 4 Pi CC-1 high-speed computer. It has a processing speed of some 740,000 operations per second, main memory capacity of 114,688 words, and a mass memory of 802,816 words. The IBM CC-2 computer, introduced on the 24th production aircraft, has a main memory capacity of 665,360 words. Also introduced on this aircraft is the newly-developed Joint Tactical Information Distribution System (JTIDS). This provides a high-speed secure communications channel for up to 98,000 users, and one that is less vulnerable to jamming. The first Boeing E-3A Sentry aircraft was delivered to USAF Tactical Air Command's 552nd Airborne Warning and Control Wing at Tinker AFB, Oklahoma, in March 1977, while the Nato fleet was delivered between January 1982 and April 1985. Saudi Arabian E3 Peace Sentinel AWACS and KE-3A tankers are powered by CFM-56 turbofans, and were delivered from late August 1986. The US/Nato Standard E-3A features a radar modified to track ships, a faster central computer with expanded memory, and improved communications equipment, includ-ing JT1DS. Ten USAF Standard E-3As are being upgraded to E-3C configuration by the addition of five more consoles and extra communications systems. The conversion of 24 early production USAF Core E-3As to E-3B standard covers the upgrade of communications equipment, including the installation of JTIDS and the fitting of extra consoles and a US/Nato Standard computer. Hardpoints for chaff/flare dispensers are also being fitted. The first E-3B conversion was delivered in July 1984. A force of 18 generally similar aircraft was acquired by NATO. Initial deliveries of NATO's operational E-3As, which are based at Geilenkirchen, West Germany, were made during 1982. They differ from their USAF counterparts by comparatively minor changes in installed avionics to meet NATO communications requirements. They also introduced underwing hardpoints to carry self-defence weapons, but these mountings can be used optionally to carry ECM pods. The Sentry has also been sold to France and the United Kingdom, all export aircraft being powered by CFM56 high bypass ratio turbofans. Engine: 4 x CFM56-2 turbofan. Endurance: 6 hr on station.